Many designers tend to insert some flash animation contents such as flash intro, flash advertisements, flash fun games, etc to make their website more attractive and interesting. However, many visitors to the website might not buy the idea. Users might find the flash contents on the site annoying and disturbing. To get rid of the flash element from appearing in the website, Google Chrome offers users a filtering option via its flash content filtering extension, namely FlashControl. 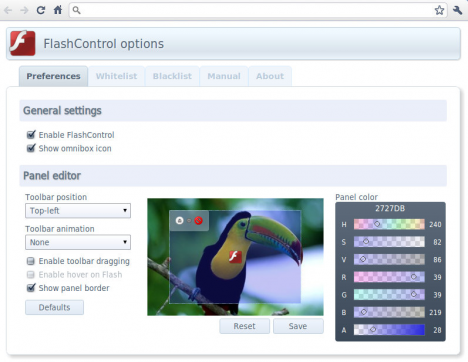 FlashControl is a free browser extension for Google Chrome that allows users to have control over the flash contents by blocking the Adobe Flash players from loading the contents. With this extension installed, users will find there is a control panel to each flash player embedded in a website. Users can turn on/off the buttons on the control panel to allow/disallow the flash player from functioning. By default, FlashControl blocks all flash contents from running on a site. Users can control manually using the control panel to enable the flash contents. FlashControl also offer users the option to identify certain websites that allow flash contents. Users can add these websites address to a whitelist so that the browser extension will not block the flash content from these sites. Generally FlashControl offers users a very flexible way to control the flash contents from the website. Users can selectively run the flash contents at their own discretion when they want. It will be pretty also very useful for users to have this extra control features to Adobe Flash players especially when the flash content are disturbing them or the interest speed is low, they can turn off the flash player conveniently.